ums and arenas, and watched by thousands at the venues and millions on Twitch). Twitch streamers (also known as broadcasters) host their own shows playing other gamers or provide commentary on streamed events. Its on-screen chatrooms are packed with billions of fans’ comment. “Chats on Twitch are not just random statements, they’re meaningful two-way conversations,” Aragon said. He disclosed Twitch has an average 15 million daily active users, three million streamers hosting content and the average viewing session lasts between 60 to 90 minutes a day. EDITORIAL DEPARTMENT Editor in Chief Julian Newby Deputy Editor Debbie Lincoln Reporters Stuart Braun, Ben Cooper, Andy Fry, Juliana Koranteng, Isobel Lee, Max Leonard, Rachel Murrell, Gary Smith, Joanna Stephens Sub Editors Neil Churchman, Neil Crossley, Nigel Willmott MIPTV News Online Editor Sunnie Newby Editorial Management Boutique Editions Head of Graphic Studio Herve Traisnel Graphic Studio Manager Frederic Beauseigneur Graphic Designers Véronique Duthille, Yovana Filipovic, Carole Peres Head of Photographers Yann Coatsaliou / 360 Media Photographers Christian Alminana, Patrick Frega, Phyrass Haidar, Olivier Houeix, Michel Johner. PRODUCTION DEPARTMENT Publishing Director Martin Screpel Publishing Manager Amrane Lamiri ADVERTISING CONTACT IN CANNES Silvia Ferreira: +33 7 78 35 43 99 Reed MIDEM, a joint stock company (SAS), with a capital of €310.000, 662 003 557 R.C.S. NANTERRE, having offices located at 27-33 Quai Alphonse Le Gallo – 92100 BOULOGNE-BILLANCOURT (FRANCE), VAT number FR91 662 003 557. Contents © 2019, Reed MIDEM Market Publications. Publication registered 2nd quarter 2019. ISSN 1967-5178. Printed on PEFC Certified Paper. from it”. As one young producer with eight years’ experience said: “I just took the decision to stop doubting myself.” According to research by mediaClub’Elles in France, women represent just 20% of people quoted in the media, 20% of morning news radio guests, 30% of experts quoted on TV, and 15% of the most-publicised media personalities. “We believe that improving the gender balance and representation of women in media is in the interest of us all,” said mediaClub’Elles director of business development Laura Boy. chant/BBC project, The Barking Murders, she added. According to Sririman, the three big challenges for any SVOD platform are access, discovery and community. “Netflix showed everyone how to do access and Amazon cracked discovery. But I think we are better than both of them when it comes to community. The challenge for us now to get better at access and discovery,” she said. Our next event: Esports BAR Miami 2-4 October 2019 JW Marriott Turnberry Miami, Florida, USA The must-attend esports event to attend! opment, so we can see which path is best.” Nickelodeon makes content as well as acquiring it. Sometimes — as with mystery drama House Of Anubis — it will create two versions of the same show, one local and one international. “We’re looking forward to Pony, a new series that came through our shorts programme and is being developed by creator Ant Blades with Nina Hahn, our senior vice-president of international production and development,” Lewis said. Pony is a 2D animated buddy comedy about a nine-year-old girl and the excitable talking pony who comes to live in the family’s apartment. have been incidents recently like the Momo challenge [a hoax about children being enticed to do things] that have made people say that they want to take their content off YouTube. We are creating little addicts on YouTube, but there is a conversation about what is healthy.” Kidoodle is in aggressive expansion and acquisition mode, and is in Cannes to find new content and content producers across a range of genres and formats to join the platform. As well as being an online OTT for the web, Kidoodle is also available as a downloadable app, providing a condensed version of the channel. “We are coming in with a competitive CPM,” Bisner said, “we are adding new content every day.” (Cost per mille is the cost of a thousand views or clicks.) The Canadian company was launched in 2014, and since then it has expanded into 140 countries worldwide. Based in Calgary, Alberta, the service is owned by A Parent Media Co.
to global recognition, it makes us extremely proud that a media giant like Telefonica would now want to entrust us with their shows on much more than a project-by-project basis,” Christian Gockel, executive vice-president international operations at Beta Film, said. “We are optimistic, from the early days of our co-operation, we have come to value the Movistar+ approach to filmmaking as unique in its perfect blend of creativity and marketability.“ As part of its 60th anniversary showcase at this year’s MIPTV, Beta Film presented a number of outstanding Movistar+ originals, headed by the world premiere of writer-actress-director Leticia Dolera’s series Perfect Life, in competition at CANNESERIES. The Barcelona-based romantic spy drama What The Future Holds also premiered on Monday. per Huu, about a cello-playing Asian nerd who is also a born and bred Aussie boy blessed with super-powers and is caught between two worlds. bring the magic in. It’s important to keep the look and feel of the original toys.” Playmobil: The Movie, which is due for release later this year, brings the classic toy to life through an exciting animated adventure which sees human kids turned into Playmobil figures. An animated TV format is also in production, as is a range of new mobile device-ready content for tablet and smartphone devices. Lars Wagner, executive board member at Playmobil, said that the modernisation of the brand had depended in a big way on bringing in new digital features to enable kids to “take Playmobil with them wherever they go”. He said: “The portability of having the Playmobil brand on your mobile is essential. You can’t really take the whole Playmobil set wherever you go so having that mobile element is really important.” Also appearing on stage at the session, which was chaired by Jesse Cleverly, creative director at Wildseed Studios, was Erik Wilstrup, founder and chief executive of animated film and TV-series producer Wil Film. Produced by Ireland’s Magpie 6 Media Entertainment, The Strand was about a close-knit group of teens spending a special summer at an Irish seaside resort called The Strand. Finally, Studio 100 from Belgium presented a comic series called Yalla! Yo!, about a streetcred obsessed Moroccan kid called Rachid living in Paris, with four white foster sisters. The selection jury included Nina Hahn, senior vice-president international production & development at Nickelodeon; Nicole Keeb, head of international co-productions and acquisitions, children and youth, ZDF; David Levine, vice-president, programming, production and strategic development, Disney Channels EMEA; Luca Milano, executive director Rai Ragazzi; and Cheryl Taylor, head of content, BBC Children’s. THE INTERNATIONAL Academy of Television Arts & Sciences and Reed MIDEM once again showcased global excellence in children’s programming through the International Emmy Kids Awards held at the Carlton on Tuesday. The 28 nominees in seven categories came from 13 countries including Argentina, Brazil, Germany, the Netherlands, Singapore and Sweden. Presenting partners for this seventh edition of the event are TV Kids, E&Y and In Development KIDS. The evening was introduced by Bruce Paisner, president and CEO of the International Academy of Television Arts & Sciences, and Paul Zilk, president and CEO of Reed MIDEM. can tell stories in so many different ways. It’s happening in real time, how do we tell it from every possible angle and from social media to feature film?” said content company Group Nine Media’s Suzanne Kolb on the difficulties facing them and the producer, Nomadica Films. 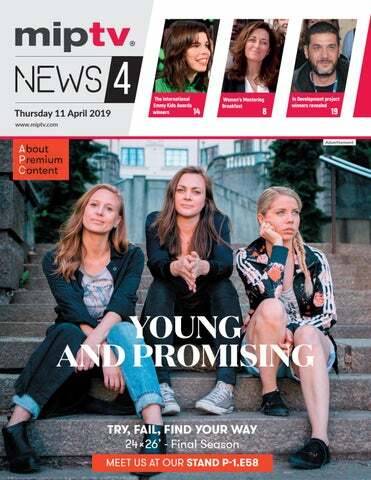 AT THE Swim session, Reed MIDEM’s Lucy Smith announced the launch in 2020 of the first MIPTV Global Goals Media Compact Award to honour a media company, broadcaster or executive who has made a positive impact on the world. In 2015 the UN launched its Sustainable Development Goals. Reed MIDEM has encouraged all media companies to sign up to the SDG Media Compact and commit to promoting these goals, Smith said. 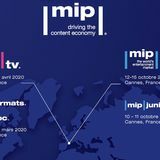 IN FEBRUARY MIPTV and CANNESERIES unveiled 16 producer and writer-led projects that, together, represented the 2019 Official Selection of Cannes Drama Creative Forum, In Development. sult of an unprecedented international collaboration between TV-makers, scriptwriters, producers and actors in three different eastern European countries. projects” and selected France/ Mexico collaboration Perfect Monsters as the one that they would like to co-develop, co-produce and distribute. Set in Chihuahua, it focuses on a series of characters, including a schizophrenic boy who falls in with a dangerous arms dealer after his family is brutally murdered. Breton named the winner of the second award, which will see La Fabrique des Formats support development, as Black-Out, the first high-end TV project from film director Nabil Ayouch. An eight-hour series, BlackOut takes place on the border between Morocco and Spain’s North African enclave of Ceuta. It tells the story of a migrant crisis that occurs when a power outage disables the electrified barriers between the two territories. The third award, offered jointly by Federation and La Fabrique des Formats, was granted to Nordic Noir drama Ice Valley. Set in a remote Norwegian Valley, it follows two students investigating the disappearance of their housemate. As they do, they uncover eerie mysteries and deaths connected to the area. ny had recently raised €5m, of which €2m was earmarked for content, and 20% of that for original productions. It had chosen a subscription model for its mix of scripted fiction for both adults and kids, while Majelan was a freemium service. All the panellists — including Universal Music’s Michael Grassi, who said that owning the IP was very important to his company — agreed that the best business model in this fledgling industry was still to be decided. Both Sybel and Majelan offered comprehensive data that would allow producers to measure audiences and monetise content. Now all they need is good scripts. New TV content connections. Unique business experience. With its pre-scheduled meetings and all-inclusive format, MIP Cancun brings you 1-to-1 with leading platforms and studios from across Latin America and the world. excited,” said Se Ran So, project manager at Flying Pig. She added that WowWow Rolling Friends is a storytelling-themed children’s show that helps threeto-five-year-olds develop creativity and problem-solving skills. SCENARIO AND MAYA SEAL MUGHAL DEAL SCENARIO Films is in Cannes with a new co-production dramatising the life and times of the Mughals and is looking for broadcast and finance partners. The Mughals were one of the oldest, richest and most vibrant dynasties the world has known, ruling over India from the 16th century until the colonial era and the British Raj, building the Taj Mahal and many of India’s other historic splendours. Scenario Films has been working with India-based Maya Movies developing and writing the 10 x 60 mins series and this week signed a formal co-production agreement. “The moment had come for the deal to be formalised and the project to move ahead,” producer Mamta Kaash of Scenario Films said. The tale promises a blend of epic landscapes, lust, power, political intrigue and ambition that the producers hope will appeal to fans of shows such as The Tudors and Rome. Maya Movies, led by writer/ director Ketan Mehta, will bring extensive local experience to the task of filming a script loaded with battles, elephants and harems, and the production will benefit both from a UK tax base and Indian production costs.